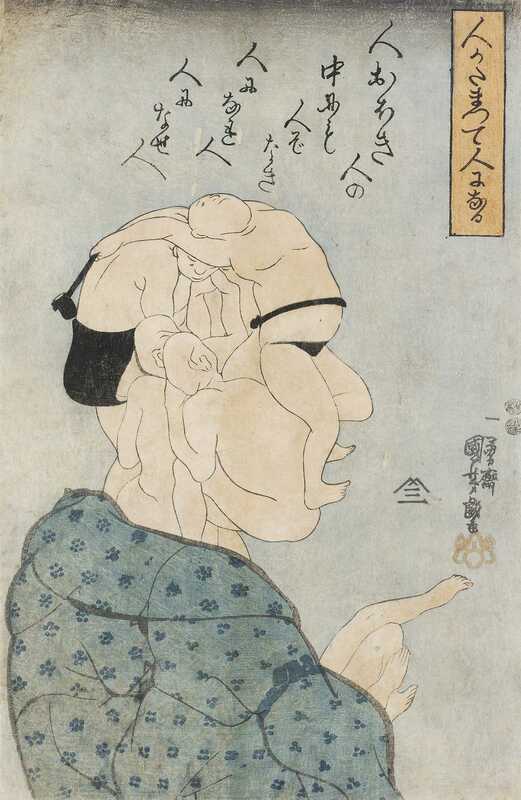 I was wandering absently through the galleries of the Glynn Vivian the other day, trying, unsuccessfully, to remember what the Welsh word for ‘unflattering’ might be, when I stopped suddenly in front of a Japanese print. It was in one of the rooms devoted to the gallery’s founding collection, which once belonged to Richard Glynn Vivian. Vivian was an inveterate global wanderer, and using his family’s copper fortune he collected what took his fancy wherever he was in the world. His artistic preferences belonged firmly to his time and class, and many of the objects he donated to the gallery aren’t much to our taste today – including, probably, most of the Japanese prints. This particular picture, though, did make me start. It’s a woodblock print made around 1847 by Utagawa Kuniyoshi. Kuniyoshi (1798-1861) was one of masters of the ukiyo-e style of printing and painting at the end of the Edo period. He specialised in pictures of warriors and actors, and his pictures are full of action, often violent and exaggerated. But he also had a humorous side, producing large numbers of caricatures and parodies. Men come together to make a man seems at first sight to be a conventional, cartoonish portrait of a man – until you realise that his head (and the rest of his body) is made up of the outlines of other men, fitted together ingeniously in various contorted positions to form a sort of plasticined heap of flesh. One description of the picture adds that ‘the topknot of the man is composed of a man holding a portable brush and ink case and the body is made of further men wearing identical kimono’. The man’s fingers, including the pointing index finger, are made from the hands and the legs, one of them bent back, of another man. there is no man at all. This appears to be a variation on John Donne’s theme ‘no man is an island’. No ‘great man’ stands alone, self-made, in isolation from the rest of humanity; we are all connected with others, and we’re all, through our genes and our life experiences, made up of other people. Kuniyoshi produced a series of similar prints, portraits of men and women whose faces and bodies are composed of the shapes of other people. Some writers have noted the parallel between these and the works of the Italian artist Giuseppi Arcimboldo (1526-93), who specialised in fantastical portraits of people made up entirely of flowers or fruit or fish or vegetables or other objects. It was exactly this similarity that occurred to me as soon as I started looking carefully at Kuniyoshi’s picture. Archimboldo’s portraits were often organised in groups, like ‘The four seasons’ and ‘The four elements’, and feature remarkably detailed and accurate depictions of their chosen objects. Water is perhaps his tour de force. 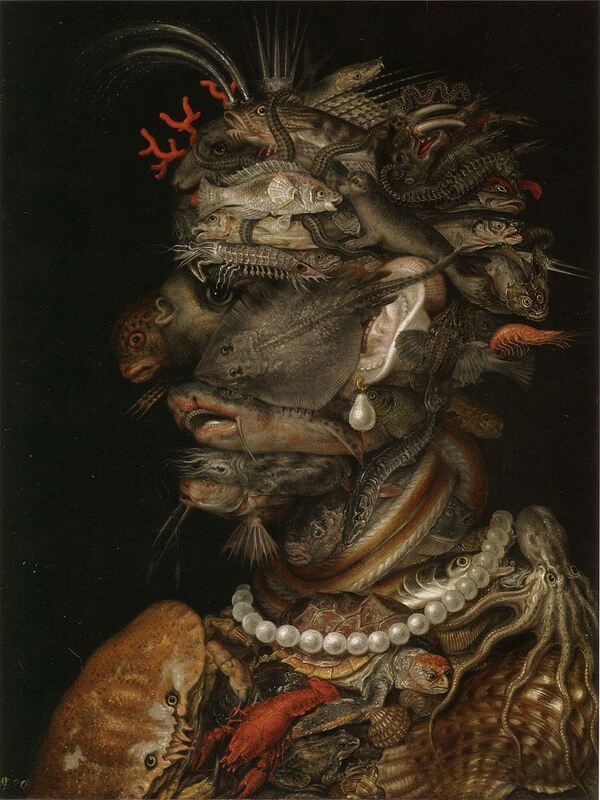 It combines fish, shells, crabs, a turtle, lobster, octopus, coral and pearls to create the distinctly slimy image of an old woman. Arcimboldo’s intentions can only be guessed at. Were his works mere ‘caprices’, as contemporaries assumed, made for sophisticated buyers who appreciated the whimsical and bizarre (he worked in Vienna for Rudolf II, the Habsburg emperor, a man of scholarly and eccentric interests)? Or did he, like Kuniyoshi, harbour a more serious aim – maybe to hint at man’s exploitation of nature to his own purposes, or the relegation of Man to the status of just another animal or vegetable? Or did he simply delight in the irrational juxtapositions of his invention? Unsurprisingly the Surrealists of the twentieth century seized on his works as precursors of their own dreamy creations. 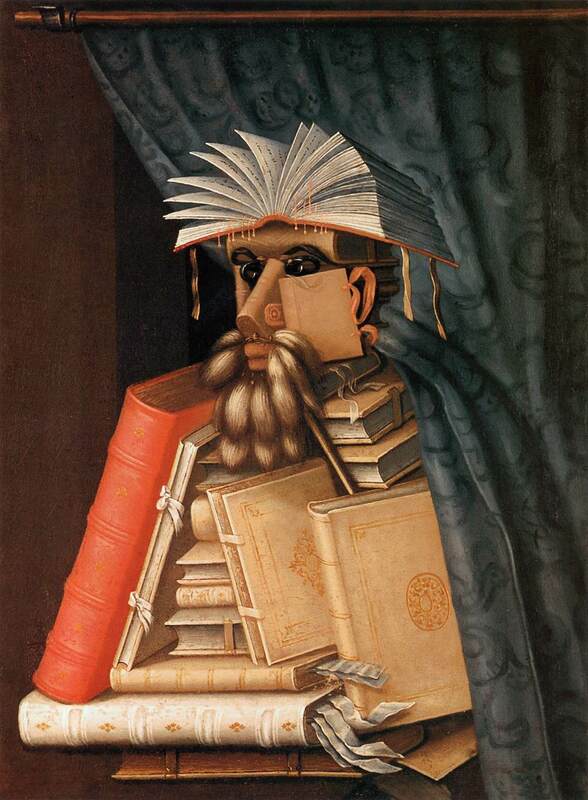 For some reason I have a particular liking for Arcimboldo’s The librarian, a satire on the dry-as-dust scholar locked in his bookroom. His hat is an open book, his eyes are key-rings, his beard a set of animal feathers used as dusters. The rest of his body is a mini-library of books, with bookmarks standing in for his fingers. No more vivid warning exists, outside the pages of Middlemarch, of the dangers of an over-academic life. These are staggeringly good. Seeing them has made my weekend!